Download and print this fold up clavichord. Bach couldn't have composed all those masterpieces without an instrument, so here is your own amazing fold-up paper clavichord that you can print out for free! 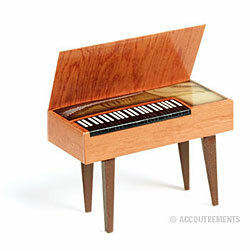 A hobby knife is recommended for cutting out the clavichord. Always be careful when using a sharp object. Ask your parents (or children) for help. Download and print Bach's clavichord.pdf We recommend using a stiff photo paper stock for the clavichord.